Happy life I have... says who? Ok! So, what happened that last night? "You are a miser, live without you I rather"
But when she reached… she kicked the stool. This post had been published by me as a part of the Blog-a-Ton 26; the 26th Edition of the online marathon of Bloggers; where we decide and we write. The topic for the month was 'That Last Night'. burst out laughing, dude, supe sarcasm, ultimate in penning. just superb. Poor Mister Teeju, jaan bhi gayi, aur kaam bhi nahi hua. @ Chicky - Now you got me interested in this Mr Nobody. I'm glad you liked the poem...err whatever you call this weird 2-line 4-line combo. I see that you have participated - will come over. @ Pramod - Thanks buddy. Glad. @ yah yah.... bol lo bol lo. But I appreciate you for being one of the motivators. That was damned funny. And sad too :( but what a way of writing, and how easily the words flowed! Ha ha ha. That was wicked. 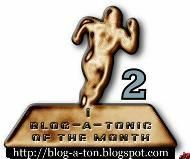 Your the most creative Blog-a-ton ic I have seen. Every time something new. @ Shilpa - Thanks Shilpa. I will be reading yours soon. See you on your blog. @ High - Lil high :) I was going through one my old posts (thoo's view) and saw your comment there. And here you are again. Thanks for reading buddy. Your name's nice... just take it looks like LLL high. Will be at your blogstep soon. @ The Fool - V kind words. Something new I do strive for (but usually end up creating similar stuff). But glad you liked it. I had to read the poem to myself so many times while writing it that I got terrible bored of it. So much so that I thought it was too long etc. But some of you liked it.... so it was worth. @ Srikanth - thanks man. see you on your blog. Wait a minute! Was this supposed to be funny or sad or what? I am quite mixed up. However I think it would have been better suited had you been talking of a girl and her poor husband. Daughters generally tend to love their dads... So this was a little unreal. That was so funny indeed...Well done! I hope it was just a poem and it is not real...fictitious poetry! I noticed how you gladly maintained the rhyming scheme! @ Enchanta - funny/sad?? My usual thing is to try to be funny. And hence the mix up. My wife did ask me to make it husband-wife thing... but I thought that's pretty usual. So, I did intentionally take up something unusual. But, I do understand your point... and appreciate your feedback. Thanks. Looking forward to reading your post. @ Amity - Hey! Long time :) All fiction!! Thanks for your words. Your writings are tremendously witty which makes it such an interesting read. Its absolutely humorous with a little unusual touch to it (the father-daughter factor). Nevertheless, beauty lies in the way you have scripted it and your effort to rhyme it so beautifully. All the best. my goodness... first very nice flow of words..anybody can just read it and enjoy it..
@ Cherry Blossom - your words are encouraging! thanks. Haha...very very funny...was laughing all the way.. great job !!! My daughter said to herself "I am a fool"
@ Sankar - thanks buddy, good luck to you too. @ Sunjoo - aisi chudail ladki suicide note ka bhi kya karti ?? ;p But I like the word limit part... good job. Thanks for coming... and leaving your mark :) Cheers! Sad and Funny ... a different take indeed! that was funny take on the theme buddy.. Keep rocking..
forgot to mention.. you rhymed so well..
@ savitaa - thanks for reading. @ SIS - thanks for your good words. Hello Kshitij ji, congratulations for your well-deserved win. I always tell you that ur writings are very witty and refreshing. Thank you so much for your appreciation of my post and for the vote as well. @ Maun v - thanks a lot buddy. @ Cherry Blossom - Hey, thanks for the encouragement. Your poem was amazing.... I say again! @ Yemiledu - I'm glad you liked it :) Welcome to the blog. All the pictures and contents on Dusht-ka-Drishtikone are protected by Copyright Law and should not be reproduced, published or displayed without the explicit prior written permission from the sole author of the blog, Kshitij Khurana. The Why and How of the time a movie reviewer got into big trouble - How Many Stars... Mr. Mohan?